For other uses, see Indies (disambiguation). Not to be confused with East India. 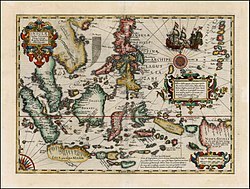 A 1606 map of the East Indies. An 1801 map of the East Indies. The East Indies or the Indies are the lands of South and Southeast Asia. In a more restricted sense, the Indies can be used to refer to the islands of Southeast Asia, especially the Indonesian Archipelago and the Philippine Archipelago. The name "Indies" is derived from the River Indus and is used to connote parts of Asia that came under Indian cultural sphere. Dutch-occupied colonies in the area were known for about 300 years as the Dutch East Indies before Indonesian independence, while Spanish-occupied colonies were known as the Spanish East Indies before the American conquest and later Philippine independence. The East Indies may also include the former French Indochina, former British territories Brunei and Singapore and former Portuguese East Timor. It does not, however, include the former Dutch New Guinea (West Papua), which is geographically considered to be part of Melanesia. The inhabitants of the East Indies are almost never called East Indians, distinguishing them both from inhabitants of the Caribbean (which is also called the West Indies) and from the indigenous peoples of the Americas who are often called American Indians. In colonial times they were just "natives". However, the peoples of the East Indies comprise a wide variety of cultural diversity, and the inhabitants do not consider themselves as belonging to a single ethnic group. Buddhism, Islam, Christianity and Hinduism are the most popular religions throughout the region, while Sikhism, Jainism, Chinese folk religion and various other traditional beliefs and practices are also prominent in some areas. The major languages in this area draw from a wide variety of language families, and should not be confused with the term Indic, a group of languages spoken in the Indian subcontinent. The extensive East Indies are subdivided into two sections (from a European perspective), archaically called Hither India and Further India. The first is the former British India, the second is Southeast Asia. 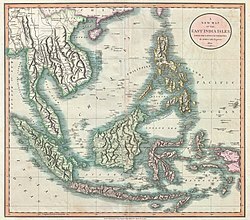 Regions of the East Indies are sometimes known by the colonial empire they once belonged to, hence, British East Indies refers to Malaysia, Dutch East Indies means Indonesia, and Spanish East Indies means the Philippines. Historically, the king of Abyssinia (modern Ethiopia) was identified with "Prester John of the Indies", since that part of the world was imagined to be one of "Three Indias". Exploration of these regions by European powers first began in the late 15th century and early 16th century led by the Portuguese explorers. The Portuguese described the entire region they discovered as the Indies. Eventually, the region would be broken up into a series of Indies: The East Indies, which was also called "Old Indies" or "Great Indies", consisting of India, and the West Indies, also called "New Indies" or "Little Indies", consisting of the Americas. These regions were important sources of trading goods, particularly cotton, indigo and spices after the establishment of European trading companies: the British East India Company and Dutch East India Company, among others, in the 17th century. The New World was initially thought to be the easternmost part of the Indies by explorer Christopher Columbus, who had grossly underestimated the westerly distance from Europe to Asia. Later, to avoid confusion, the New World came to be called the "West Indies", while the original Indies came to be called the "East Indies". The designation East Indian was once primarily used to describe people of all of the East Indies, in order to avoid the potential confusion from the term American Indian who were once simply referred to as Indians (see the Native American name controversy for more information). ^ "East Indies". Encyclopædia Britannica. ^ "The Present State of the West-Indies: Containing an Accurate Description of What Parts Are Possessed by the Several Powers in Europe". World Digital Library. 1778. Retrieved 2013-08-30. ^ Kitchin, Thomas (1778). The Present State of the West-Indies: Containing an Accurate Description of What Parts Are Possessed by the Several Powers in Europe. London: R. Baldwin. p. 3.